Welcome to Racing Games HQ, the top source for free online racing games. We specialize in finding the best car, bike, and motorcycle games available on the Internet. The joys of setting the road on fire. The joys of making the steering wheels screech with every drift. Wouldn't you just love to be in Vin Diesel's shoes in the Fast And The Furious series? Well, for sure you do. BUT not all of us have the skills or the inclination to spend our lives racing and putting our necks at stake. Not to mention the authorities breathing down your neck is really uncomfortable. So what's a Vin Diesel wannabe to do? Simple - settle for the next best thing and rule the world of racing games online! And here at RacingGamesHQ.com, with the best and most exciting racing games on the internet we have here, we will take you a step or two closer to ruling the world of racing games! Whether you are an expert online racer who wants games that are not just intense in racing BUT in action too, or if you are a newbie who just wants to have fun and maybe kill some time before the boring office shift ends, you can bet that we have the online racing games that will suit your taste! If you want your racing games to be explosive, filled with gun-slinging scenes, and always on the rush...racing to the finish line, you came to the RIGHT place! RacingGamesHQ.com's Top 10 list of racing games online showcases only the cream of the crop in racing games. Each game guarantees you hours of nonstop, wheel screeching, and road burning fun. And to make the deal even sweeter, our top global scoreboards allow you to showcase your score for everyone to see! Cars Racing And Bullets Flying Around! If that's your definition of entertainment, then High Speed Chase 2 is your game! 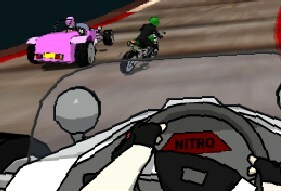 Currently the top 1 on our list, it's NOT surprising at all why this is the MOST played game here at RacingGamesHQ.com. It's intense and exciting - a racing game with bullets flying around! In your quest to be the next top agent, you need to complete missions - one is more difficult than the last. Take out your targets and get to the next mission. Sounds simple? Nah! Not when you consider that the guys you need to take out are armed too and you need to earn at least a bronze medal to get to the next level. If you want something unique and original...AND EXPLOSIVE, you simply have to try out DestructoTruck. The name says it all. It's about driving a truck and making sure you cause as MUCH destruction as you can in your wake. Earn points and upgrade your truck...beef up its stats and make it more destructive than ever. Earn awards and unlock smash streak bonuses - all for the name of destruction! Drag Race Demon 2 is for you! You need to race through 12 very challenging races to become the next Drag Race demon champion. Now, this is not your usual and average racing game. It's a one-on-one match up on a straightforward race track. What's the challenge? Your opponent - skilled and adept at racing, will you be able to beat him?